Newark – Delaware State Police are investigating the armed robbery of a Newark area convenience store that occurred yesterday morning, according to Public Information Officer, Master Corporal Michael Austin. Austin said the incident occurred at approximately 11:15 a.m., Wednesday, January 10, 2018, at the 24/7 Food Mart, located at 2445 Pulaski Highway, Newark. A white male suspect entered the business and approached the 27-year-old, male clerk at the sales counter, and pointed a handgun at him, said Austin. The clerk then complied with the suspect’s demand to give him all the money out of the register. After obtaining an undisclosed amount of cash, the suspect exited the store and fled in an unknown direction. The clerk was not injured as a result of the incident. The suspect was described as a white male, wearing all black clothing, a black hat and in possession of a black handgun. A dry cleaners in the same shopping center was robbed at gunpoint just a day before. Here’s that story. 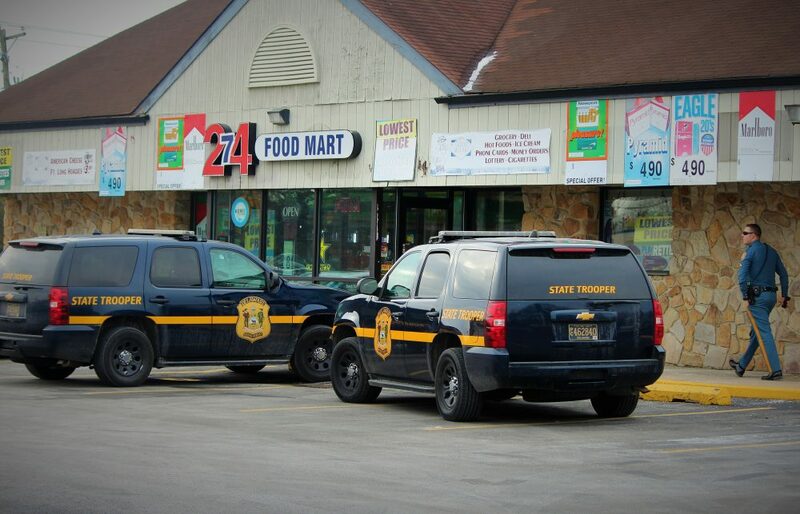 Glasgow – Earlier this afternoon Delaware State Troopers responded to 2445 Pulaski Highway for reports of an armed robbery that had occurred at the 24/7 Food Mart. At this time not much is know about the suspect or what time the robbery occurred. Further details about this incident will be provided as authorities release more information.